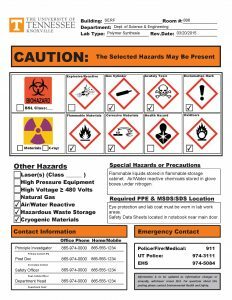 All labs on the UTK campus will be marked with a Laboratory Door Placard that is facilitated by Environmental Health and Safety. Submit it via email to the lab placard coordinator who will then print and post them. Update them when changes are made or annually (whichever is more recent). Includes: Joint Institute for Advanced Materials (JIAM), the Law Enforcement Innovation Center (LEIC), Auxiliary Services Building (part of CEE), and the Middlebrook Building).